The Hell You Say has an almost palatable innocence as if sung by someone. three bad relationships away from bitterness. 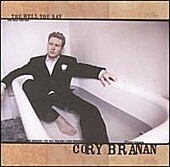 Listening to Cory Branan's debut album, part of me roots for him to find love, the other wonders what art might come from destruction. This album with obvious country influences, also has it's periods of Blues- heavy motion toward rock. The lyrical pictures are finely detailed and feel like memories from a time when things weren't as confusing but didn't fit in the order we understood. No clearer do you find this as in songs like Skateland South and Crush that carry a familiar awkwardness of a childhood rational of love. At times you think Branan will erupt, voice be damned, into a desperate country yodel or a primal rock scream just to get out what's inside. Over all his song writing skill is the presence most felt in this collection. He's telling stories you listen to for the details. They hold you to the end spread over a primer coat of subtle instrumentation. In three of the tracks Branan is joined by a beautiful harmony in Kim Richardson. Though he's getting a lot of mainstream press, don't let that scare you away. Hell, sometimes they can luck out and pick up something that's good. Think Whiskeytown era Ryan Adams. Think first sips of Beer, cigarettes with friends in autumn nights still warm from hot summers. Think the last innocent crush you had on the girl next door, before you knew that ache of a broken heart in your chest. Rating: A.